FOR THE FIRST TIME, Belfast’s pride parade will include uniformed PSNI officers for the first time. The PSNI said its officers and staff have been involved in the pride parade for many years, but this is the first time they will do so in uniform. 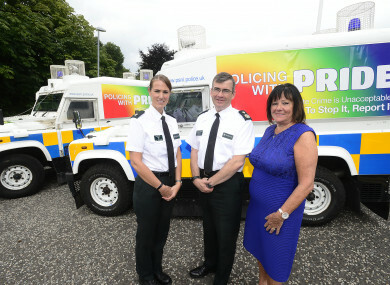 Three PSNI vehicles will also be in attendance at the parade on 5 August, carrying the message ‘Policing with Pride – Hate crime is unacceptable – To stop it, report it’. Hate crime should not be tolerated and victims should be encouraged and feel confident that when they contact police that their concerns will be taken seriously and responded to appropriately. “Pride is an important series of events for those in the community who identify as being LGBT. Policing board chair Anne Connolly welcomed the fact that uniformed officers will be participating in the parade, “demonstrating the diversity among PSNI officers and staff and PSNI support for lesbian, gay, bisexual, and/or transgender people across our community”. It’s a very sad reality that homophobic and transphobic hate crime continues to be committed in our society. “This is not an issue for the police alone to deal with but as they are often the first point of contact, the message and service provided by the PSNI is critical,” Connolly said. The PSNI said that its ‘Policing with Pride’ Landrovers will also be used the at Newry and Derry pride events. Email “Uniformed PSNI officers to take part in Belfast pride for the first time”. Feedback on “Uniformed PSNI officers to take part in Belfast pride for the first time”.